Would anyone argue that content marketing can be one of the most cost-effective tools for growing a business? That’s probably why it feels like all the content marketing advice is from snake oil salesmen with dodgy “get-rich-quick” hacks. Even the more reputable proponents of the discipline focus more on the promotional aspects of it than what should be at its core – producing interesting content that people will want to read/watch/listen to. At the Paris stop on the Inside Intercom world tour I gave a talk covering some of the things I’ve learned running the content team at Intercom over the past two years, as well as insights I picked up working as a professional journalist for almost 20 years. You can watch it below, or if you’d prefer to read, there’s a transcription after the embed. I’m the Managing Editor at Intercom, so my team looks after all our content such as this blog, books like the Jobs-to-be-Done one we just published and our podcast. There’s a lot of talk about content marketing at the moment. Google the phrase “content marketing” and you’ll find some amazing stuff about how to game Google and make sure your posts are in the top 10 results. It’s all “get-rich-quick” schemes about the marketing and promotion, and there’s very, very little about the content itself. I’m going to explain how you can create really good, quality content that will help grow your business. That post generated plenty of traffic when it was published. It still generated traffic six months later, and it continues to do so 18 months later because it’s timeless. If you want to create evergreen content, thought leadership is a must. The post “Why cards are the future of the web” was written by our VP of product, Paul Adams. We published that two and a half years ago, but it still generates hundreds of page views for us every week. The scary picture above was taken at Mobile World Congress earlier in 2016. It makes the point that evergreen content is not about news events like when a major conference is on and you know a lot of people are going to be searching for stories related to it. That kind of content will get you a very short lift in visitors to your site. 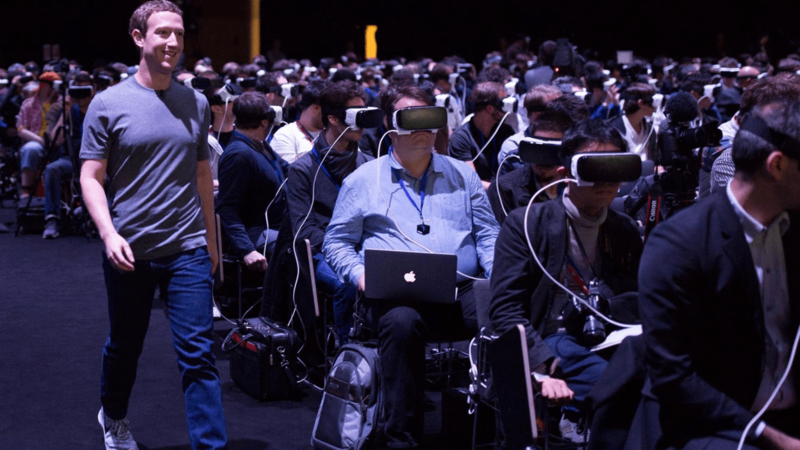 They only came because you had some story related to why Zuck was wrong at F8 or what to expect in the next iPhone, and they’re not going to hang around for anything else. Content – and most marketing – is the same; you’ve got to hold your nerve. The great thing about content marketing though is, unlike other types of marketing, it’s a compound return. The more you put into it, the more you will actually get out. This graph is from Tomasz Tunguz. He’s a venture capitalist with Redpoint Ventures, and he blogs about SaaS, as well as the whole business of software. He compared an evergreen blog, which wrote this kind of timeless content, and a very news-related blog, which was writing timely or topical content. Both blogs got a hundred views for each article on day one, and they both published the same amount of articles every week. Tomasz ran the numbers and looked at what happens over a year. Something very interesting happens. 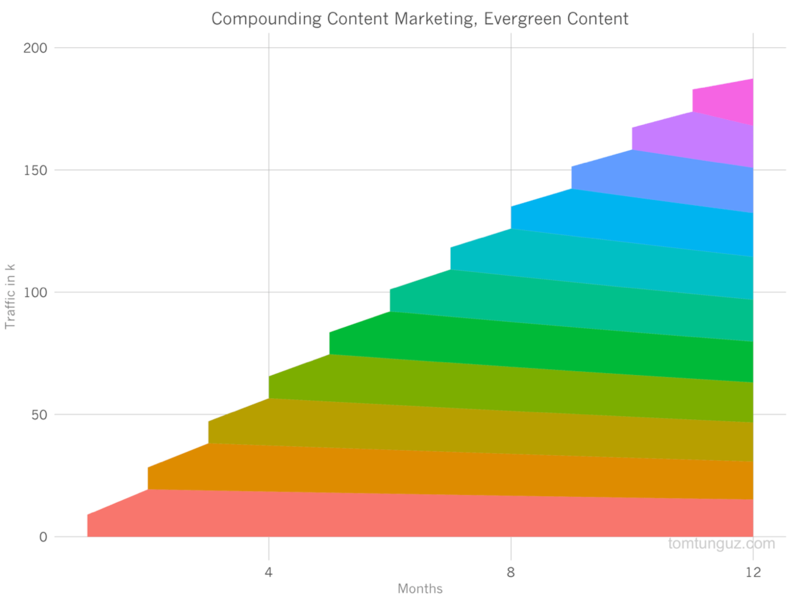 Although it involves the same amount of content and effort, the evergreen blog grows faster. Tomasz found that it gets 3x the audience or traffic of something news-related. That’s because evergreen content decays much more slowly. If you’ve written a post like that aforementioned example about how to file a good bug, in a year’s time it’s still generating traffic. If you’ve written content about the next iPhone, in a year’s time it’s generating minimal traffic. I actually worked at a national newspaper, and newspapers talk about the value that sits in their archives. But after two days of a news story, it’s getting no traffic. After a year, if it’s getting one visit a week, that’s impressive. Meanwhile, evergreen blogs get bigger. One great thing for me and my team is that an evergreen blog is much easier to manage, because you’re not trying to run a news calendar and figure out what topical events are coming up. In fact, we manage our editorial calendar at Intercom with a simple Trello board. There are a couple of traps that a lot of corporate blogs fall into. The first one is death by feature lists. You know those blogs where you see, “Oh, we’ve introduced version 3.4.6 of our product. It’s really interesting. We did this and that.” That post doesn’t even tell the customer what it will do for them. Then you’ve got the “We’re so awesome” blog, which usually features lots of pictures of the CEO, who is generally wearing a suit. Yet the CEO doesn’t even contribute to the blog. He doesn’t want anything controversial or opinionated to appear on that blog, but that’s why people come to you. They want to read something that’s got an opinion. Another pitfall is people who try to create content they think cool and edgy. They believe they’ll get an audience, and when the audience comes, of course they’re going to buy their product. So they publish articles about why you need a work spouse – an actual example from a well-known software company who I will not name. Did anyone buy a support product after reading that article? I severely doubt it. Taking things back down to earth a little bit. People are probably familiar with the 5Ws and 1H. It’s a technique journalists have been using for years to write news stories: the who, the what, the where, when, why and how. I’d like to run through a content marketing strategy and how you might be able to apply that approach to it. Who’s going to produce your content? At Intercom, we believe this should be the specialists. These are the people doing the job: the product managers, the designers, the engineers. My team’s job is to work with those specialists and tell them what makes a good story that people would be interested in. We then help them edit that story and make it read better. 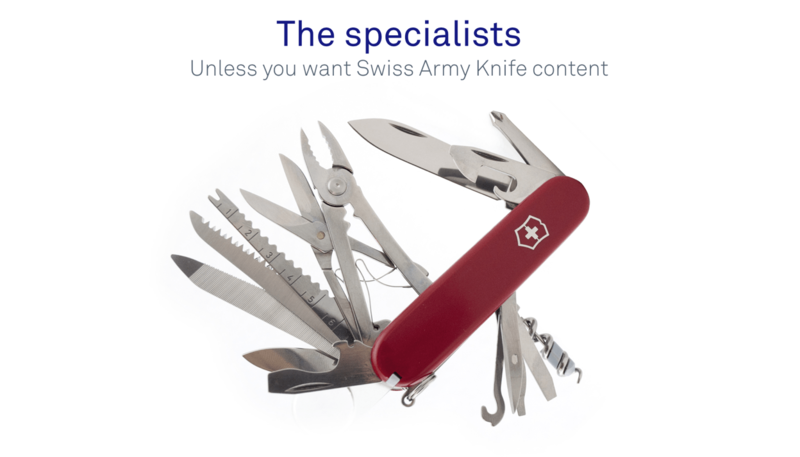 Yes, a Swiss Army knife is a knife, but you would never ever bring it to a knife fight. Specialists will write something with much more depth than anything I would write as an editor or a journalist. It’s really important that this comes from the top of the organization. Des Traynor is one of the co-founders of Intercom. He actually ran the content marketing at our company for two and a half years and still regularly contributes even though he’s our Chief Strategy Officer. As a result, no one sees writing content as a chore at Intercom. It’s even baked into team and individual goals. 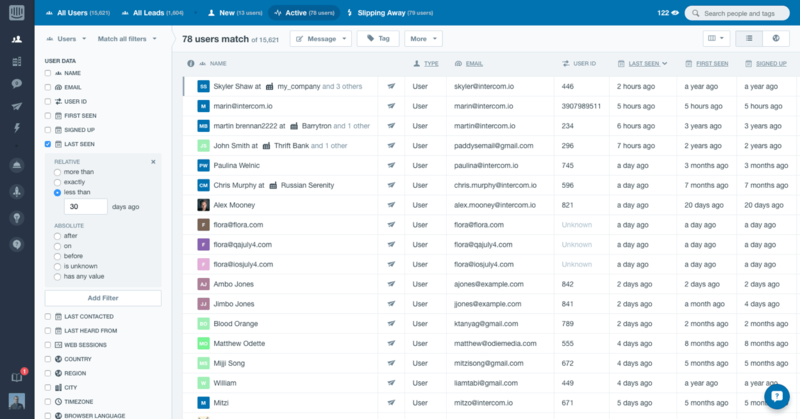 Pictured above is the user list in Intercom. It’s what you see first when you login, but it’s more than just the opening screen. This is an embodiment of our belief that web business should be personal. You should be able to see what your customers do and drill down into that information. Go and look at our auto message flow. It’s actually the embodiment of our belief that the right message must be sent to the right user at the right time and on the right device. Of course we write lots of content about this. We even wrote a book about it, Intercom on Customer Engagement, and that book has been downloaded over 40,000 times. 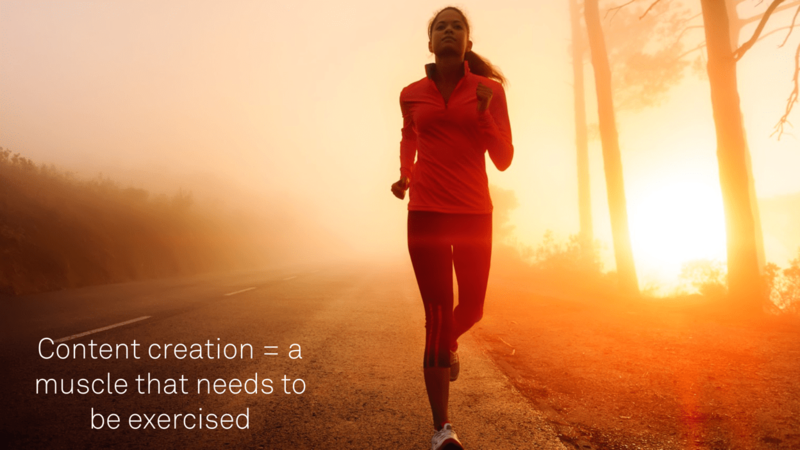 It’s about writing core content that really relates to your company and what you believe in. Think about what your core beliefs are as a company, and then start writing about them. Building a startup is a leap of faith. You’re jumping off the cliff and you don’t know what’s going to happen on the way down. If we can help people build a little part of that airplane, that’s really valuable content that our customers are going to constantly come back to us for. If you’ve got a startup, a company, you must be experts in something. You know about your market. Have an opinion about it, and write about that content. If potential customers come to you and see you as a thought leader, and you can help them, that’s really valuable. Where are you going to publish? This used to be very simple. You would fire up WordPress, Blogger, or another platform and start blogging. It’s a lot more complicated now. Podcasts are very popular, and it’s easy to create and publish books. Basecamp’s Signal v. Noise blog is an interesting example. They still have the blog, but they have moved it to Medium. Medium is not just a platform like WordPress; it gives you an audience and a network as well. But you cede control for that. Instead, you might want to consider republishing articles on Medium rather than moving our entire blog there, which is a tactic we use. Think of content in terms of all the different places you can put it. This is quite a successful blog post for us that was written about two years ago. It’s about all those situations where a product manager is told, “We have to build this because our competitors have it,” or “We have to build this because the CEO wants it”, and the product manager has to say, “No”. In 2015 we turned that post into a microsite with a small email capture form at the bottom. Our sales team actually closed a really big deal with one of the leads we got from this. That one piece of content, a blog post, has also been a video and a core part of our first book, which is about product management. When are you going to publish? This is one of the biggest mistakes people make. They’re excited to have a content marketing strategy and they say, “We’re going to publish every day; we’re going to publish three times a week.” They start with these unachievable goal, and after a while they run out of steam from churning out jaded content. Over-enthusiasm in the early days is a big issue. Something that really struck me when I joined Intercom was the amount of people who asked, “Wow, where do you guys find the time to do content?” They weren’t asking us where we find the time to design or where we find the time to code. If you’re going to do this, it should be a core part of your marketing activities. Why are you producing content? Don’t lose sight of why you’re doing this. Content generates lots of social media recognition and lots of traffic, but that doesn’t pay the bills. The graph above shows traffic to the Inside Intercom blog since 2011. Traffic alone doesn’t pay the bills unless you’re selling advertising. That’s not that useful: engagement is much more important than traffic. In the cities where we operate, San Francisco and Dublin, it’s really hard to attract talent. Many people who interview with or have joined Intercom did so because of the thought leadership and the articles we write on our blog. That’s a huge benefit. And of course, you write content to sell software. Never lose sight of that. How are you going to produce all this content? Creating content is one of those things that you learn by doing. Sitting around, reading Medium articles, looking at Twitter or coming up with spreadsheets of different article ideas – none of those things are actually content production. The only way to do this is to get out there and do it. It’s like running. Sitting on the couch thinking about where you’re going to run next week is not running. Do it and make your mistakes early, when you’re still relatively small. Editorial systems are key to scaling this. They’ve been established for years in newspapers and broadcast networks. Set up a simple calendar for ideas. Think about your workflows for getting things published. It’s very easy to set up, but it’s amazing how many people have successful blogs or content and don’t do any of this stuff. I’ll leave you with four key takeaways. You have to stay committed. Don’t jump into this and expect results straight away. It will take a bit of time. Don’t get carried away with the buzz of publishing. You need traffic that’s turns into engaged customers, that convinces people to buy your product. While this is true at all times, in the early days it’s particularly important because content that you create is probably the only public face of your company. You’re not doing PR, you’re not doing trade shows, so your blog or your podcast is going to be the only way people can begin to know your company. There’s so many unintended and unexpected benefits of doing content well, from easier hiring to being able to visit cities like Paris and do events like this. If you like our approach to editing and publishing, why not join us? We’re hiring an Editor in San Francisco.